Onwards to a Greater MapleSEA! As MapleStorySEA continues to progress on with more and more updates, there has also been an increase in botting activities in the game to the plight of many of our players. As of recent, we've decided to ramp up on placing tighter measures in our efforts to combat this never-ending plague in our game. Unfortunately, this may have resulted in some of our normal users being suspended alongside for setting off the elevated bot detection criteria that has been put in place. All such suspensions will only be lifted by getting your identity and account ownership verified; this is because we need to make sure that your accounts are not being compromised and/or used for malicious purposes. As a gentle reminder, as per Asiasoft and Nexon's regulations, we do not encourage the usage of 3rd party programs in our games. To avoid getting blocked or suspended from the game, all players are advised to turn off your VPN services before accessing the game. Please also be reminded that each person may only have one Asiasoft Passport account and that account sharing is not condoned. 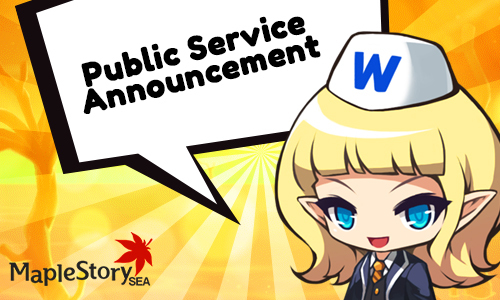 Together we can make MapleStorySEA great again!